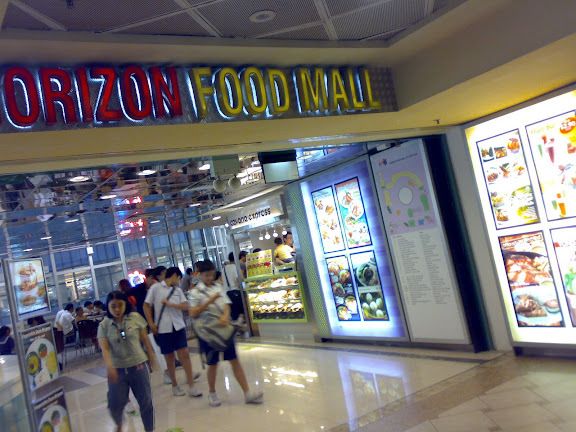 Tucked at the side of Level 5 of Causeway Point Shopping Centre is a large food court that has a selection of Halal and non-Halal stalls. This should not be confused with the Banquet Food Court at Level 6, which is completely Halal. 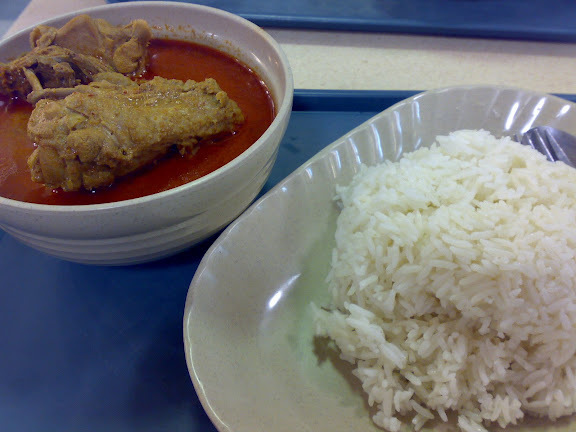 I wanted to have lunch at Horizon because of a particular stall, "Hawker Delights", which sells fairly good curry. It's been quite a while since I've been here, but I can say that the curry is still good and the portion remains large - two potatoes and three pieces of chicken. John had one look at what I had and ordered the same thing as well, and nodded in agreement when I asked if it was good. Our only comment then would be that the curry would have been better if it was spicier, because this one is still a bit mild to our trained tastebuds. The rice was a little hard too, but that's a small matter. 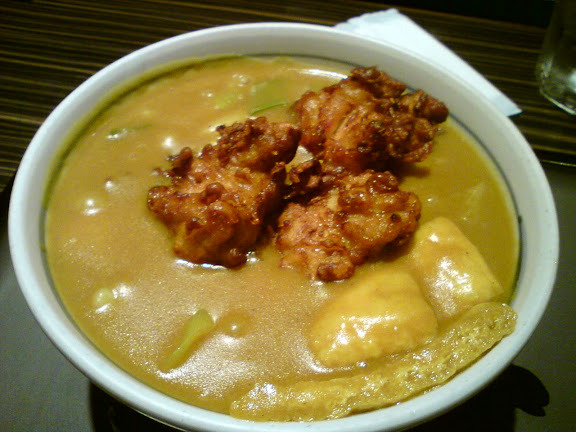 If only I could order chicken wings only, like the chicken curry stall at the Kopitiam food court at Vivocity. Still, the curry gravy was thick as I liked it and managed to soften the otherwise hard rice. Very friendly. The stallholder kept asking if I wanted more rice when he had already served me a pretty huge portion. $0.50 for the plain rice. 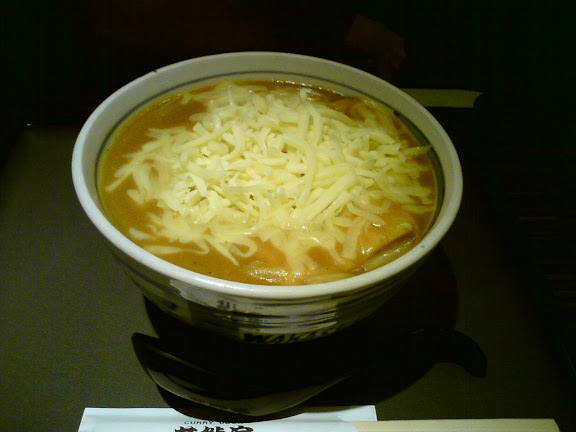 It was funny how one of my friends, who just returned from the US after a short study stint, scoffed at Pasta de Waraku and was reluctant to believe that such Italian-Japanese fusion could be any good (later, other friends continued to tell him that it wasn't as bad as he would assume it to be). 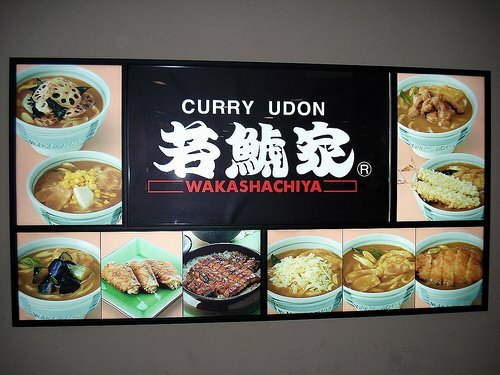 Eventually, we were deciding between Waraku (the original one) and Wakashachiya, and somehow or the other kare udon, Japanese curry udon, won the vote. The menu in Wakashachiya isn't very extensive. You can have a basic curry udon or "upgrade" to one with a main ingredient (we tried quite a few of them below), or even add more than one main ingredient. Nicely enough, it turned out that all of us tried different things. This time round, I got my friends to rate their own food. I liked the udon noodles a lot because it was thick and chewy, and was a good contrast to the very crispy and firm deep fried prawns. 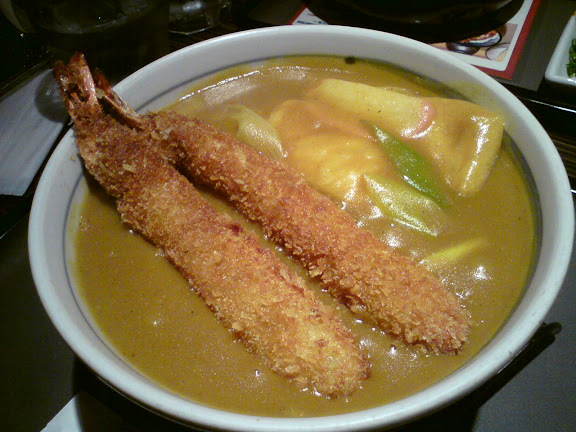 The curry wasn't as thick as I would have wanted it to be, but nonetheless it was sweet, as Japanese curry should be. I like it for being a little spicy too, which fits the Singaporean tongue better than the more bland tasting ones. John decided to go for the fried chicken and liked it quite a lot, especially the curry gravy. He smacked his lips and nodded with a satisfied nod: I'll give an eight for this. Tyler tried one of the best sellers here, but apparently he wasn't too impressed. I think this had to do with the pork cutlet being too dry and probably a tad oily. Wei Jie admitted that he isn't an udon fan after dinner, but commented that he liked his udon for the cheese since it made the curry gravy more starchy (he used the word "sticky"). One thing he didn't exactly like though was the lack of ingredients as he was only given the standard curry udon ingredients in a couple of Japanese fish cakes and fried tofu skins. Ming Yan was the more adventurous of our bunch, choosing the sole rice dish in Wakashachiya. She felt that it was interesting that it came with a small note on how to eat the dish in three different ways (instructions were given to divide the portion into four, with the fourth portion as the individual's favourite mix). The mixes included wasabi, spring onions and even a small flask of "dashi" (bonito stock). 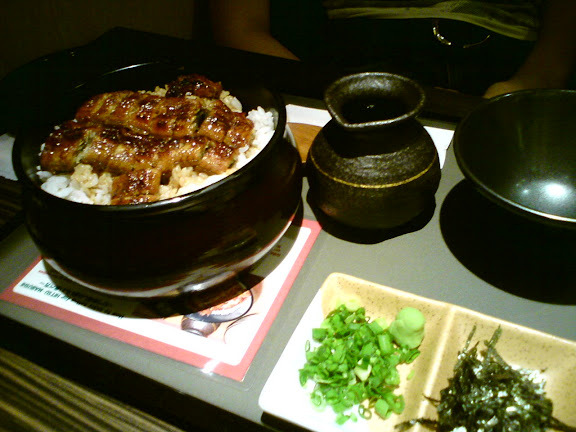 Hitsumabushi is really a more innovative form of the typical glazed Japanese una (eel) over rice. While the taste was quite ordinary and deserved more of a 6, Ming Yan felt the step away from the conventional way of eating una don was something positive indeed. Service was good, though it seemed that the restaurant was pretty short-handed for a Thursday night. One manager-looking male and another female staff were all that I saw going to and fro the tables. Still, they were always pleased to help, which is good. I'm not exactly a fan of Pastamania because I think the pasta here is pretty much standard and ordinary. Still, since everyone was looking out for something less heavy on the wallets, Pastamania turned out to be a natural choice for a group dinner. Daphne remarked that the latest promotion is meant to deal with the sudden price hike and to get customers back. I would think so too, especially since Shokudo Pasta is just a few steps away and they are priced as competitively as Pastamania's. It's good to have competition, because the customers will benefit! What is this?! Anyone could tell how disgusted I was after a few sips of the soup. It was bland and pretty much tasted like tomato-flavoured water. I don't even know what exactly are those bits of stuff floating around in the soup (I would suppose they are tiny chopped up pieces of vegetables). Dipping the garlic bread (which was way better in terms of taste) into the soup didn't help. I was contemplating if I should just go back to basics and order this. Contrary to my expectations, it was not too bad, and actually had pieces of beef that I could eat (rather than those that just have a glob of paste), and I like the fusili that they used, even if you may argue that it could be bought at the nearest supermarket. Pastamania could have done better by having an "upgraded" recipe for Arrabiata by adding ingredients to the pasta, but at the same time maintaining its spiciness. This pasta was plain except for the sauce and "chilli padi" (really spicy small chilli). Jiayang had this very thin and rather small pizza. I'm sure it didn't fill him up much, but he said it was worth the money when combined with the soup and bread. He found the pizza normal. You can choose to have your pizza folded into half like a puff if you like. Jocelyn had this for herself. Ingredients are quite scarce, just the few slices of mushrooms, though this pasta would fit those who like their pasta creamy. They try, but don't get me started on Chinese nationals as service crews. I don't think I'm expected to speak Chinese just to get my message across in my own country. We wanted to try out something at the Bugis Junction basement, and it came down to Fisherios and Uncle's Kitchen, fish and chips against asian food. As much as I was more in favour of Uncle's Kitchen, Daphne spotted that the cook didn't wear gloves and was handling the food with his bare hands. So we decided to give Fisherios our first visit instead. Fisherios serves its food wrapped up like a baby, and is easy for takeaways. There's not many seats available but it wasn't difficult finding one. To be fair I doubt it's about food quality, because watching the crowd, I realise it's often more of people trying to escape the crowd (coming especially from the MRT) by heading up to the upper levels rather than lingering around to see the food. This was a promotional set that had both the chicken and the fish, perfect for someone who can't decide but wanted to try both anyway. Although the chicken marinate was not too bad, the problem was that it was too oily, and it even had a small pool of oil below it! The fries were alright, but the fish was terribly ordinary. It's the same type of breaded fish fillet that you could find at heartland shops and food courts. For the price, it really was not worth paying $6.90 for two small slices of fish fillet that could be gotten for cheaper elsewhere. 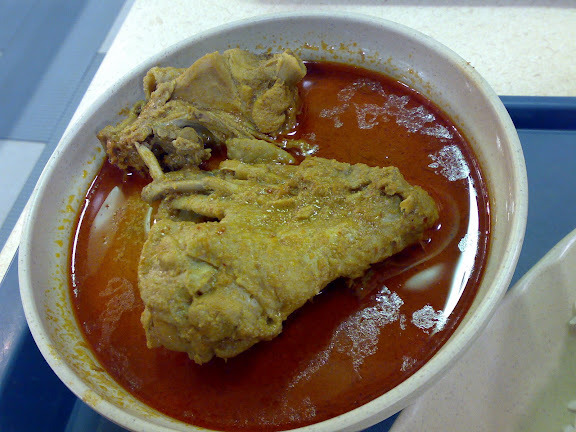 On close-up, you can see that it does have a crispy outer layer covering white tender meat. On an even closer look however, you can see the fish glistening in oil. The fish is fresh yes, but the oil was the problem. Friendly, though can be a tad persistent. The indian waiter kept trying to use chinese like "ta pow" (takeaway) and "xie xie" (thank you), which I found amusing. $6.90 for the Breaded Fish Fillet. Daphne also added $2.90 for a drink and a salad, the latter of which she found fair and ordinary. The portion was quite small. And here's the menu, just in case you're thinking of dropping by. You might like to try their beer battered fish fillet, which certainly looks more promising. 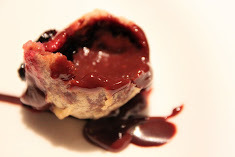 There's definitely nothing to worry about our appetites, because it's sooo healthy, but somehow I think we're starting to get on a habit of having desserts (me especially), which simply blows away any chance of dieting for sure. After our dinner at Ichiban Boshi and a couple of hours of walking around, we needed somewhere to rest our feet. My eyes caught a promotion at Spinelli's, which was giving away a 50% discount for all its cakes and pastries because it was relocating to another place within the building. With such a good deal, how could we resist? Haha. And oh, stay tuned for more reviews on eating places at Great World City. I've seen quite a number of places that I would like to try, and I'm sure we'd be back here soon! I have a friend who studies in the US, and he says that all the cheesecakes that he has tried in Singapore (including NYDC) cannot compare to those served in the US. Still, since I have not had the chance of travelling to the US, I guess I would have to settle for the local ones for the time being. This one in particular was good, very smooth, soft and moist. Daphne proposed a swap, but I said no HAHA. Even for a chocolate lover like me, I'm not exactly a fan of the very chocolatey cakes because it gets difficult to hold down after a while. This chocolate cake was very rich as well, but it helps if you alternate between two cakes rather than keep going at it. You've got milk, dark and bitter chocolate lingering all around this cake, quite admirable. Since we had the 50% discount, ours went for $2.10 and $2.40 each yay! After my most satisfying lunch here during my MFA internship, I thought I should bring Daphne here for dinner. Since I was only aware of two branches, one in Great World City (where I had my lunch) and the other in Novena, we decided on Great World City since we have not gone there before in a long while. We were saying how our trouble of taking a bus down to Great World would seem a waste of time if there was actually a branch as near as Orchard (which, on checking once I got home - Orchard Centrepoint, and also Esplanade and Suntec City hahaha) but I needed to satisfy my Japanese food craving. 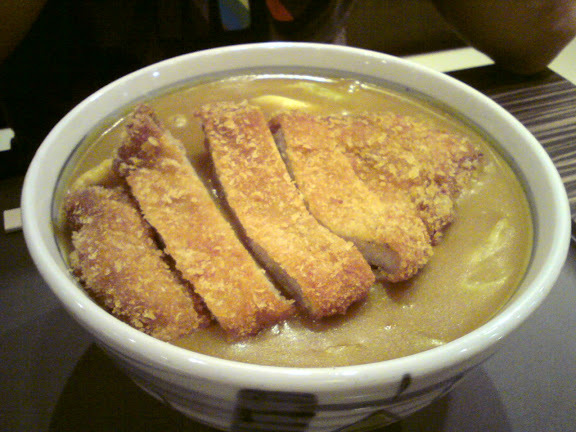 I could almost taste the chicken katsu when we were on the bus I tell you haha. This is definitely one of the better Japanese curries that we've tasted, and it came out sweet, warm and definitely not burnt, as most others often taste. We liked this curry too because it was spicy (and not just sweet). Yums! Daphne liked this more than I did, probably because I felt the potatoes had a different taste than the ones that I am accustomed to. Still, it was very crispy on the outside but so soft and potato-ey on the inside, and we enjoyed it muchly heh. At least for the Great World City branch, this restaurant is merged with a small Japanese market that specialises in fish, sauces and sushi. I had to hold back myself from stuffing myself with inari (rice wrapped in beancurd skin), which I also personally enjoy. Started by the popular Tung Lok Group, Zhou's Kitchen has seen a steady expansion across the island city and has branches at Far East Square, Anchorpoint and Novena Square 2. Undoubtedly a mid-end range chain as compared to My Humble House, Club Chinois or the seafood haven in Tung Lok Seafood, Zhou's Kitchen was meant to target families as well as those with a smaller budget. Me and Daphne were actually on an even smaller bufget for lunch to nurse our already battered wallets, but somehow the pictures in the menu outside Zhou's Kitchen did look appetising. With the alternative in the Fork & Spoon foodcourt on the upper level of Square 2, we both thought we'd just have to dig a little deeper into our wallets, again. This is the state of students who don't work during their three-month long holidays as it is. This is an appetiser served at every table, and us hungry people munched happily away. We thought it was cool to see that it was more than expected, until we realised that it wasn't free and costs us $3. I think braised e-fu noodles is like a staple during ten course dinner events, though me and Daphne do wonder why it's often served at the end rather than at the start. The noodles here is not too bad, and managed to strike a balance by not being too dry nor too wet. Limited ingredients however, just a few mushrooms here and there, making this more like a vegetarian dish. The portion is fairly large though, which is good. It looked good on the menu, and has more ingredients than mine like chinese sausages and meat. Daphne however found it a bit too salty for her liking, and with a large portion, then found it too much as well. This was delightful, fried to a crisp with tasty shrimp fillings. Zhou's Kitchen has quite a lot to offer on the dim sum menu but we didn't want to overeat. This was good enough for us, a most valuable side dish to add taste to our noodles. 2. High Tea Dim Sum buffet offered. Me and Daphne were walking around The Cathay with the intention to head to Plaza Singapura for dinner. Somehow so many of the people at The Cathay's basement were eating Shihlin's "Happy Box" and we thought it looked quite good. Even when she was having a slight sore throat, Daphne insisted that our dinner has been decided for us already. In the "Happy Box", Shihlin's famous crispy chicken cutlet (mixed with a generous dose of pepper and spices/chilli) is served with rice, tofu, and bits of century (preserved) egg. For those who can't take spicy food, you should tell them to add just a little bit of chilli, because our chicken cutlet was terribly spicy and Daphne was coughing a bit too. We still enjoyed it anyway, and this branch in particular didn't have its cutlet too oily, which was good. $1.30 for a bottled soft drink. I've always wanted to try this place out when me and Daphne were undecided over where we should go for dinner at Raffles City, but we never did. So when my camp mates were trying to decide on a place to go for lunch in IMM, Streets seemed like the best choice, especially when it wasn't that crowded yet. We were a pretty large group of twelve, but I'm showing you just some of the food we ordered. No ratings for those I did not taste, so just look at the pictures and maybe try to figure out how they would taste in your mouth. Haha, ready to be hungry? Sylvia, one of the freshie girls, recommended this to me and being a fan of beef and kway teow (rice noodles), I certainly couldn't say no. Aside from the raw-tasting beansprouts, the noodles overall tasted good with the right amount of sauce and not too much oil. Beef was tender too. Good recommendation! The very standard and un-fanciful fried rice served at most Hong Kong style cafes. Nothing much to shout about haha. I would say that these fries can be quite an acquired taste. I didn't exactly like it at first bite, but the others enjoyed it very much. The closest taste I could think of is probably sweet potatoes, but I would prefer sweet potatoes actually! Crispy and very... pumpkin-ny. I think I didn't really like the salty egg yolk bit. But Daphne insisted I give a very high rating for this (she's having a craving this very minute whilst I'm typing this)! I like these fries because they were value for money ($3.90 for a pretty big basket) but the name "mayo fries" can be misleading because they serve the mayo separately in a small saucer (more servings can be asked from the waitress of course). These fries are much better than the usual fast-food places because they are fatter (and thus, as my usual word - potato-ey), crispy on the outside and soft on the inside. Delightful! Good. They were patient and attentive. Citibank card holders get 10% off total bill. The third stop of the camp's "A-Makan" Race was Niqqi's The Cheese Prata Shop, otherwise more affectionately known as Fong Seng Prata. If you realised, all three of the stops are relatively near NUS, and with a purpose too, since we wanted to get the freshmen accustomed to the places nearby. By this point, most of us were full enough not to order more than the stipulated dishes (the freshmen helped themselves to yummy bread at Petit Provence at Holland Village too) for the activity. If you're thinking why is this place called Fong Seng Prata, it's because it's just a stall away from Fong Seng Nasi Lemak. Apparently, these two stalls have an agreement to allow customers to eat food from either places at their tables. This of course leaves out the stall in the middle, which coincidentally has kept changing hands and has been faced with poor business for as long as I could remember. I hesitated on giving a rating on this because I personally don't fancy cheese with pratas, and it would probably come out looking bad when it isn't that horrid after all. In all fairness, it looked alright but I felt the flour/dough and overall flavour was missing somewhat. Very ordinary, and the tastes are like... Separated? It's like plain dough and then plain cheese, if you get what I mean. I wonder where this "plaster" prata came about, and how it caught on, because quite a good many places in Singapore are starting to sell this. It's a variation of the egg prata because instead of cooking the egg together with the prata, this one is kinda cooked on top (but still a little joined) of the prata, letting you have a fuller taste of the egg. So yes, it's stuck on the outside, just like a plaster. The plaster prata in this case was just alright, the egg did not have much taste other than being a tad burnt. Seriously, if you ask me, I'm not really a huge fan of Niqqi's. It's just that it's the only place to go for supper if you're around school for camps and the like. I think the food is pretty much so-so, and it's not exactly cheap too. The maggi goreng is just cooked instant noodles Indian style, but there is little effort on ingredients. Portion is small too. Very dependent on their mood! I think good business from students have gotten into a lot of their heads. Waiting times can be terribly long too if it's crowded. Below $2 for the pratas each, I think a plaster goes for $1.40. Maggi Goreng is about $2.50.